the sweetest goodbye – the aftermath. Look at this face. Absolutely pathetic. Daniel and i picked up our sexually confused son from the vet on thursday night after the lady at the front desk called me and said that he had been whining and wanted to come home. I was extremely excited to hear that he had done well in surgery and should recover just fine. I was even more excited that he was still rather groggy from the anesthesia when we picked him up. We got him home and i think reality started to set in for him. he wasn’t allowed to have any food or water and got yelled at anytime he showed the slightest hint of wanting to sniff between his legs to see what had gone on. 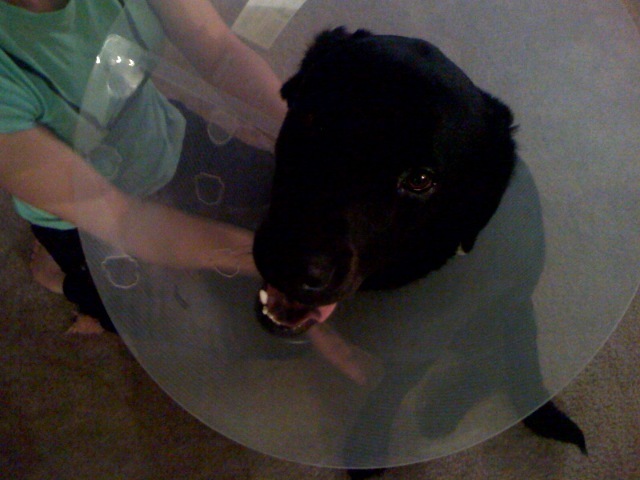 after a few hours of high mantiance watching him like a hawk, i grew tired of it and decided to give the $15 cone i had purchased a try. these pictures show the resulting moments of pity. 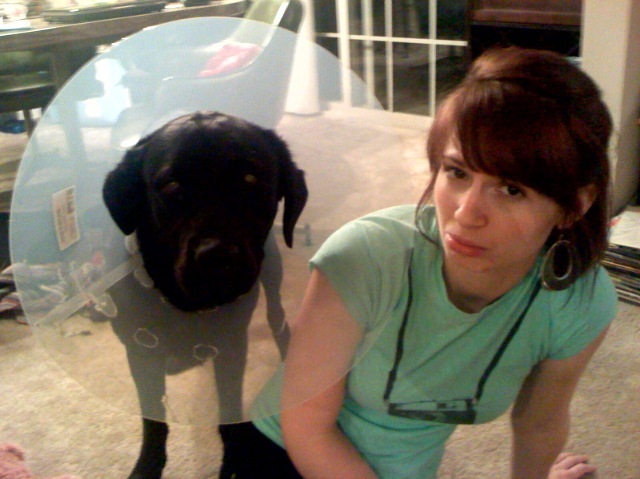 Once the cone was secured, he did not move. his eyes grew huge and his heart started racing, but he didn’t budge. his eyes would follow one of us around the room, but that was it. after a few minutes he realized that he was still able to move and all was fine until he ran into a wall, which sent him into a frenzy of running around and hitting things, making him freak out and run around even more. my heart broke as i watched the scene unfold in front of me, and if you could really see his eyes, yours would’ve too. i decided that i tortured the dog enough for the day and elected to put him to bed in his cage. little did i know what a fight that would turn out to be. with his head growing in diameter by at least 6 inches in each direction, he didn’t fit in his cage so nicely anymore. after many attempts at helping him get in and turned around, and almost loosing a finger, he was in and down for the count. which included pitiful whining & whimpering all night long. He was back to his annoying, hyper, non-cooperative self on saturday and has been so since. my only prayer is that the lack of testosterone in his body will effect him in the next month and he finally calms down to an enjoyable state. Previous Post the sweetest goodbye. Next Post someone suprise me.